Much like the company it comes from, Ardbeg Whisky is an example of rigour, meticulous attention to details and utter focus on quality. The production and ingredients of this whisky say it all, starting with its malt. 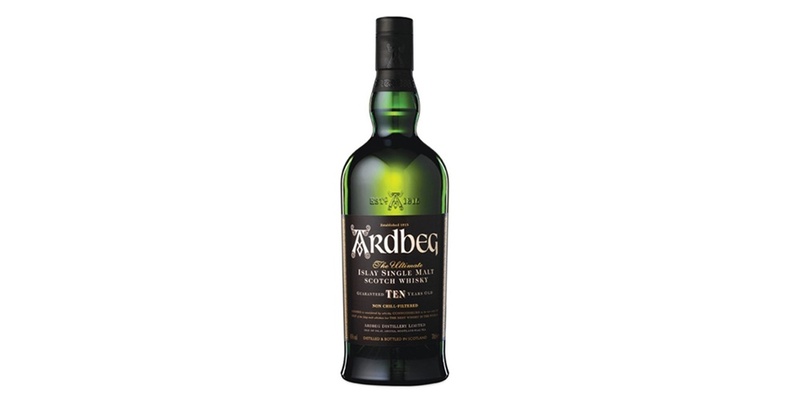 Ardbeg’s malt, in fact, is the one with the most phenolic in it, thus the smokiest. Such feature makes this whiskey a unique item in the marketplace. It is peated to a level of 50 ppm and ever since 1981 has been coming from the maltings in the Village of Port Ellen as that is how long Ardbeg hasn’t had floor maltings for. Furthermore, when produced at the Distillery, it is crushed into a substance called grist, the realization of which is achieved by a quite rare Boby malt mill, installed in 1921. The water used to produce Ardbeg comes from Loch Uigeadail, 3 miles up the very hill that surrounds the Distillery. As it streams down the hill it then runs into Loch Airigh Nam Beist to reach its final destination where the burn takes it to Charlie’s Dam at the Distillery where it is piped right into the Mash House. Ardbeg’s 10 years old whiskey is a masterpiece. Its uniqueness, represented by the use of a malt from a very specific region and a quite original production process, is as appealing as its affordability. Ardbeg’s 10 years old is, in fact, not only the lowest-priced but also the most largely available from Ardbeg’s selection. This whisky is bottled at 46% alcohol by volume (92 proof) and is non-chill filtered as well as being drawn entirely from ex-Bourbon barrel aged stock. Ardbeg’s 10 years old has a light appearance and a golden color. The peaty and smoky quality that distinguish this drink from its siblings can be noticed right off the pour and it is destined to grow more evident as the whisky is consumed. A hint of white grapes with strong strokes of peanuts and brine is also worth mentioning. Ardbeg’s pale and almost translucent coloring is overcompensated by a fierce impact on the palate. The feel on the tongue might feel light and delicate, however the flavor is ardent and strong. Salt leads the way and opens up the way for the full force of the smoke, which follows in very short order. The finish is ushered in by the smoke, which strives for its day in the sun after the swallow. Lingering notes of salt and vanilla cream keep company to the omnipresent, persistent smokiness, which makes this drink so original. Such flavor is also very much revolves around a robust blast of peat smoke, as mentioned above, however notes of citrus, vanilla, honey and a little grassiness enrich it profile considerably. In the finish, too a peppery and spicy feel, only winds down with a lingering ashy, charcoal like flavor. A few drops of water might be the way to go if your the owner of a softer palate. Such a move initially overshadows the classic smoky feel on the nose. After giving the glass a few swirls the burn will be slightly tamed. The water, then, seems to unbalance the alcohol burn and peat component, making the aroma sharper and omogenous. Recent bottlings of Ardbeg 10 are often accompanied by the addition of the adjective “New” in front of Ardbeg 10 as it refers to the one made from distillate that was created after the company was purchased by Glenmorangie in 1997. However, nothing changed in terms of flavor, producing and identity. Ardbeg 10 still keeps its old school, authenticity, whether is labeled new or old. You can purchase a bottle for $50 and see, or rather taste it for yourself.